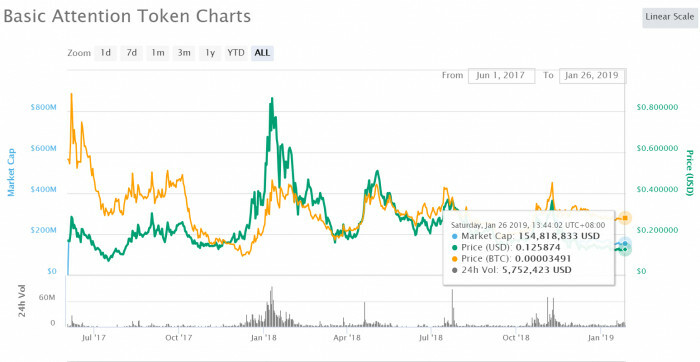 The price of BAT / Basic Attention Token has decreased significantly compared to its all time high of over 90 cents. BAT was trading at 12 cents when I authored this post. That is a price drop of over 70%. Naturally, many BAT investors are dissatisfied with this price action. Regardless of how it performs in price, BAT is one of the biggest crypto projects, with a large successful ICO (raising over $30m in 30 seconds to close successfully) and a consistent position within the top 100 cryptos by market cap with recognition across the crypto and advertising space. BAT has the potential to grow big, but how big? I will try to answer this question with some rough estimates here. The price of Basic Attention Token depends on several factors such as usage, speculation and holding. And usage is the most significant factor. BAT's primary market is the digital advertising market. This is a huge market and it still has a lot of room for growth. According to statistics from emarketer, global digital ad spending will rise to 316 billion dollars (2019 estimate). And this market is expected to grow above 420 billion dollars by 2022. This market is dominated by Facebook and Google at the moment. Google occupies 32.3% of this market. That means, over 100 billion dollars are spent on Google ads (32.3% of 316 billion) annually. If Brave Ads can hack even 1% of this market, it will have 3 billion dollars spent annually on buying BAT. If you divide that amount by 365, it returns a value of little over 8.2 million. A stable buy pressure of 8 million dollars each day will likely drive BAT price above at least four times its current value. I am making this estimate based on previous price action and volume BAT had. BAT generally has a volume of 3 - 6 million dollars per day. If we add 8.2 million extra buy pressure to this, BAT's volume increases to 11 - 14 million. Previously, whenever BAT sustained a volume of over 10 million, its price went to 50 cents or higher. This is a very conservative estimate because the newly added volume is wholly buying pressure and zero sell pressure. I will talk more about estimates at the end of the article. Other than the Ad market, BAT will have other use cases in products built by Brave Inc. A few months ago, CEO of Brave Inc stated that he would consider building a VPN service. If any such service is offered on the BAT ecosystem, it will use BAT as an utility token. This will put additional buy pressure on the token price. One other factor that provides value to BAT is speculative investments. That is, people betting on the success of BAT. This is something that is impossible to predict. The dynamics of speculative investments change rapidly. Since it is a free market, BAT will always have a speculative value attached to it. Now, let me answer some of the common questions about BAT price potential. Answers are based on my 2+ year experience in crypto. How high can BAT grow? What is the ceiling for BAT price? I think it is reasonable to base BAT's potential upper ceiling based on Google's current Ad Revenue. Google's ad revenue is 95 - 100 billion dollars. If 100 billion is spent every year on BAT ads, its price will be in the range of 200 - 600 dollars. That's over 1600 times its current price of 12 cents. This estimate of course doesn't mean BAT will reach that peak. It is to give my readers an idea of how high bat can grow. What is the mid term 2 year price potential of BAT? If BAT can on onboard ~10 million users into the opt in brave ads system, then BAT could have a price of 2 - 8 dollars. The price will depend on the location, wealth and social status of users onboarded to the BAT ecosystem. Why is BAT price so low now? The reason why BAT price went down so much is because it doesn't have any proper use case yet. The price was largely based on speculation. When the Brave Ads feature is released, BAT price will likely get a boost. Disclaimer: What I have stated so far in this article is based on my personal opinions. This is not investment advice. All investments have risk. And I own some BAT tokens.